In today's world, where fast-food restaurants, soda, and processed foods reign supreme, does "fat dad" have to mean "fat kid"? Digital entrepreneur and beloved vlogger Shay Butler and his preteen son, Gavin, decided to find out the answer for themselves. Loved every bit of this book, I cried many times throughout listening. 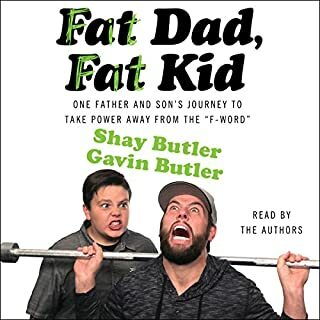 the fact that I could relate to everything Shay and Gavin were talking about (I just lost 20kgs myself) made the book that much more meaningful. Thank you Shay and Gavin for sharing your story and letting us all be a part of it.